If you're like us, you're constantly on the hunt for the perfect small computer. 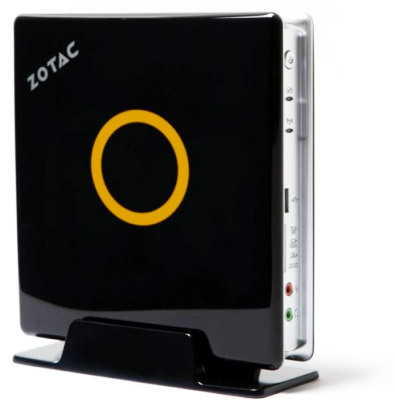 Now, we're not saying we've found it in this new set of Zotac Zboxes... but we do like where they're coming from. The minimal slivers pack Ion chipsets along with Intel CULV CPUs, making for a power-sipping experience that can actually push a couple of pixels (a couple, not many more). The company is dishing out a few varieties of the mini PCs, all loaded with some variation of Intel's Celeron processors. The HD series (the NS21 and ND22) pack a Celeron 743 or SU2300 CULV (respectively), DDR3 RAM slots, a 2.5-inch hard drive slot, HDMI and DVI-I ports, along with NVIDIA's Ion GPU. There's also an ITX series, all sporting those same CPUs, a single PCI Express x16 slot, a handful of SATA / eSATA hookups, and HDMI, DVI-D, and VGA connections. All the systems have a slew of USB ports, the boxes can be mounted in four different positions (including on the back of a monitor), and though retail pricing hasn't been announced, it looks like at least the ND22 should list for around $270. Hit the source link for all the details, and More Coverage for a review.